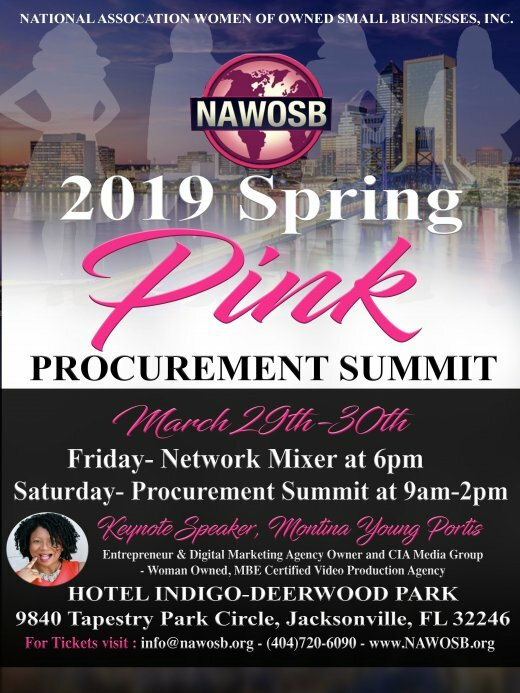 National Association of Women Owned Small Businesses, Inc. (NAWOSB) invites you to join us at our Annual Spring PINK Procurement Summit. Participate in our Roundtable Discussions to hear and receive information on Jacksonville Contracts and other Opportunities, Marketing, Social Media, Funding and much more! National Association of Women Owned Small Businesses, Inc. (NAWOSB) incorporated in 2010 is headquartered in Atlanta, GA. We are a membership based business organization with more than 400 women business owners representing diverse industries. Our purpose is to educate women owned and other small businesses on how to obtain Corporate, Education and Government contracts. Procurement Summit, Saturday, 03/30 @ 9am-2pm. We look forward to meeting you and learning about your business.